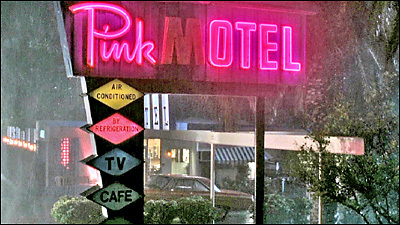 The location: The Pink Motel. A. 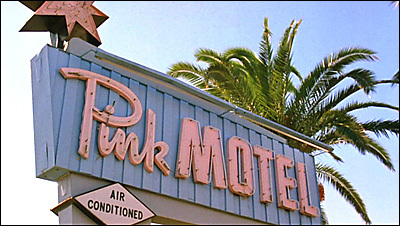 It is actually called "The Pink Motel", and it's located at 9457 San Fernando Road, in Sun Valley, CA. Dating back to 1946, this unique little motel has appeared in a number of films and TV shows, including 2004's "The Whole Ten Yards" (with Bruce Willis & Matthew Perry) and "House of Sand & Fog". Where the heck is Sun Valley? In the northeast part of the San Fernando Valley, about three miles northeast of Burbank, south of the Hansen Dam. Here is a map link. A. I had found the motel earlier while researching locations for "The Whole Ten Yards" for my Seeing-Stars website..